Our systems can be tested 24/7 through our MiDealer app. You can perform the following tests as a dealer using the MiDealer app. You can hence perform an installation test with the app at any location at any time you wish. 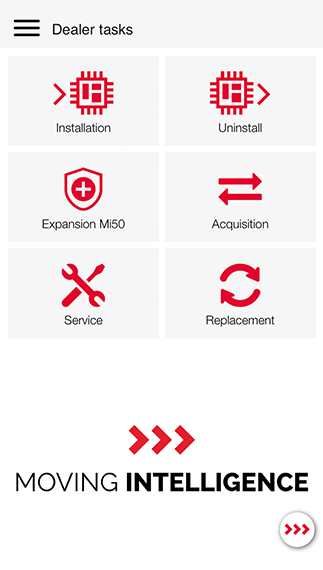 Of course, you can also transfer or de-install our systems through the app. When you have installed a system, you must use this tool to test the system for correct functioning. Various aspects are verified, including the GPS reception. In order to conduct the test successfully, make sure that the object is outside with the engine ignition off. As soon as the components have tested in order, green check marks will be displayed automatically. You can register a Moving Intelligence system as being de-installed using the de-installation test. After this has been done, you can make the unit available again for installation in another vehicle. The services of the previous contracting party will be automatically terminated. This will be confirmed by e-mail. If an Mi50 tracking system has already been installed and activated by the customer, it can still be expanded with additional accessories, such as an MiClassify and MiReader. With this test, you can check the added accessories for correct functioning. With the service test, you can check a system that has already been activated for correct functioning. This can be necessary for example a periodic inspection. In order to conduct the test successfully, make sure that the object is outside with the engine ignition off. As soon as the components have tested in order, green check marks will be displayed automatically. If a system has become defective, you can link a new unit to an already activated vehicle with this dealer task. You need the registration number and associated Mi number in order to conduct this test successfully.